Researcher by training, employed as an analyst with expertise in political science & qualitative research methods. Experience in designing and carrying out research and evaluation projects with social science twists. 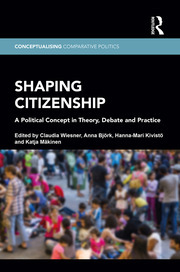 PhD & postdoc-projects in the field of citizenship studies and political concepts. After some years spent at the university, now working in the private sector as an analyst, carrying out assessments in support of public policy and political decision making. Also involved in a project for launching an open access book series in the field of political science. Background in Political Science, mainly conceptual history and political rhetoric. PhD and post doc -projects in the field of citizenship studies, Further interests include integration, naturalisation, political theory, the politics of time & temporality and political concepts. The current research projects deal with such issues as gender equality and human rights.